"This recipe has many vegetables and three kinds of meat. Most people can't tell it's not all beef and I've been told I ought to market it. This sauce has no acidic after taste, which is frequent with sauces that have tomato and/or bell pepper cooked over long periods of time. 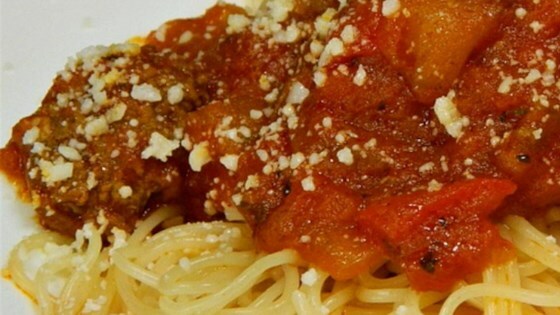 This sauce freezes well and can be used for other recipes." In a slow cooker, combine crushed tomatoes, diced tomatoes, tomato paste, tomato sauce, and kielbasa. Set slow cooker to High. Heat olive oil in a large, deep skillet over medium heat. Cook onions, squash, green pepper, and garlic in oil until onions are translucent. Transfer vegetables to the slow cooker. Place ground beef and ground turkey in a large, deep skillet. Cook over medium-high heat until evenly brown. Drain, crumble finely, and transfer to slow cooker. Season with bay leaves, peppercorns, basil, marjoram, thyme, and oregano. Cover, and cook on High for 2 hours. Remove lid, and cook 1 hour more. This "sauce" came out more like goulash, and I wouldn't make it again. Considering the time this recipe takes to make, and the outcome (more like goulash and not quite spicy enough), I wouldn't make it again. Not bad, just not what I had expected. So much work. So not worth it. Spaghetti Sauce should have some spice to it, this did not. Very disappointed. Wonderful! We made several batches and froze. We will make even more sauce this year because we absolutely love this recipe.